I spent much of this summer reading books on the environment and one fo the most important works on the subject was Carl Safina's book Beyond Words, What Animals Think and Feel a seminal, enlightening and absolutely wonderful book that has greatly inspired me and reawakened observations I've long had about the intelligence and thoughtfulness of animals. After reading the book, I reached out to him on Facebook and got in touch again when I was in Houston witnessing the effects of Hurricane Harvey. I mentioned that I helped rescue a cat when I was filming in a couple's flooded living room. I didn't intend to make a post on his site, I just was reaching out as a person who thought that he would be interested in what I had witnessed, so I was honored beyond belief when he invited me to make a post on his center's site. I came down to Houston following Harvey’s impact to continue on with my documentation of climate change and the impact it has on our communities and society at large. Once I made my way into Houston, I went directly to the rescue boats that were saving people just outside of the the flooded Energy Corridor near the I-10 freeway . I learnt a lot from what I heard people tell me that afternoon. I also learnt from a cat who was rescued along with a couple as they left their home. One of the first rescues I witnessed on the boat. On my boat were 2 rescuers: one was piloting the boat and the other was steering it and was its lookout. Streets literally became canals and we slowly drifted through these new bodies of water trying to dodge submerged vehicles and fire hydrants. From the front of the boat the lookout would bellow R E S C U E, slowly and loudly, the word drifting off into the neighborhood. Rather than echo back, dampened by the humidity and lost in the soggy landscape, the call petered out leaving a dull silence in its absence. On a cul-de-sac we drifted by one house with chimes. They sounded odd and lonely in this transformed landscape. A frame grab of the house with the white sheet. Halfway down the block a door was slightly opened onto one of the waterlogged homes—It was the house with the chimes. When we drifted over to the flooded doorstep the woman (not old in the least: she had vibrant alive eyes and was wearing a Marvel super hero t-shirt) asked, “Can you give me 10 minutes?” The rescuers were understanding and of course granted it to her as she and the man who was with her packed their things as they sloshed through their waterlogged home. I got out of the boat and started filming their last moments in this place. I felt like I was barging in (I was) but they agreed to let me document these moments. Carmen and her companion gathering their belongings. The woman’s name was Carmen and after holding off for days a decision was made to finally evacuate. As we passed by twice their decision to stay or leave was still being considered and was only reached once we had cut the engine at the end of their block, an example of how excruciatingly difficult it is for people to leave even under the most dire circumstances. 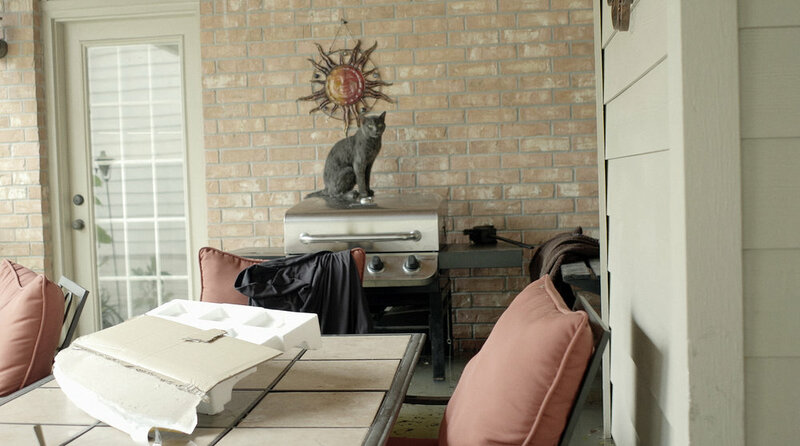 A frame grab of the cat on the barbecue. As I filmed in their dark waterlogged living room I saw a cat sitting atop a barbeque through a window. It was licking itself intently. I found it odd that this cat was perched there. Wouldn’t it try to get away? I wondered if it was tethered to the grill to keep it from leaving. I peeked through the window and realized it wasn’t—anyway, in such a chaotic situation anything was understandable. While going through the fridge to take some food with them, Carmen said that the cat was a stray and asked me if I could help them take it. As I felt like I had already barged into their home, and even though they permitted me to document their leaving, I was secretly thankful for her request and put my camera down. Good with cats, and having a memory from a recent trip to Tokyo where I could have saved a cat but didn’t, I wanted to give it a shot. With the water rising for days I have no idea how long the cat was there, but I know that he did not make his way there without trauma. In between licking himself the cat would enter into bouts of hyperventilating and long drawn out meows indicative of being in distress. As I approached him, in such a traumatized state, I wondered if he would even let me near. But, upon seeing me, there was no aggression on his part, only a stern caution which I thought at any moment could turn into a violent defense. To test things out, still well out of arm’s length, I spoke to him gently, the way I would have with my cat that I had as an adolescent. A frame grab of the cat after I had moved it to the living room couch. He remained impassive, so I took a few steps toward him, arm well extended and unmoving, and slowly brought my hand to his face to let him smell me. He smelled with curiosity. I took my hand away and then brought it back a couple of times; each time he kind of bounced his nose off of my fingers jerking his head back and forth. I felt a glimmer of trust here and made the decision to try and pet him. He backed away at first, but then came nearer and let me pet him some more. The breathing calmed down and I thought there was almost a purr emerging and therefor a depended sense of trust. This told me all I needed to know: that he was a cat that was well loved and trusting of people. Not without fear and squirming, he let me pick him up and I placed him in stops on various surfaces (one long cary would have been way too much) placing him on garden table, to kitchen table, to living room couch, where the man Carmen was with finally put him in a basket and then then brought him to the rescue boat. Where the cat is now, I do not know, but at the very least he got a second opportunity and hopefully has a new family in the couple who evacuated with him. 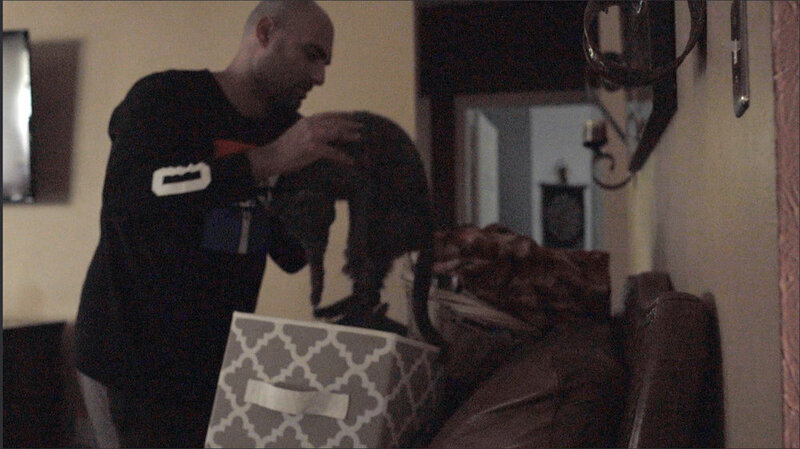 A frame grab of the cat being put into a basket. A frame grab of the cat on the rescue boat with the boat’s spotter. A frame grab of Carmen on the rescue boat with the cat. Only after I had returned to my motel room and was taking a day off was I reminded of Beyond Words. I started thinking about what might have been going through the cat’s mind. The cat had choices and made them: it could hiss or meow, distrust and fight or trust and let it be picked up and rescued—in short he acted in a certain manner in a very intense and frightening situation which would have warranted even the most domesticated animal to act defensively. But he didn’t act defensively. And that’s why I believe he was making choices—choices as anindividual being. I don’t know if he was aware of the choices he made (I question if some of the people were aware of what they were doing in the most intense moments in Houston)—but he made choices and that can be said with certainty: he communicated in his cry for help, a wailing drawn out meow and then, having been acknowledged, acted in a way befitting of the call for help. Having been in the aftermath of Hurricane Katrina and extensively documented the devastation in Fukushima for the past 7 years, one thing I’ve come to realize is that disasters strip all the artifice of life away. Only the core of society and people remain revealing the best and worst of their personalities. I can now say the same about the animals that are in these situations, too. I am briefly reminded of the cat I found with a dear friend I was with in Tokyo. Next to one the canals that runs through the city, the cat was very sick and nearly starved. My friend and I went to a corner store to get it a can of food, thinking that’s the least we could do. When we returned with the can and opened it we thought it would go right for the food. But it didn’t. With the can in front of it (I cannot remember its gender therefore I call it, it), it nestled its head against our ankles affectionately rubbing against us. Initially we saw the cat only for its condition—as a being in need of the bare essentials, but what it truly needed was love and attention as its choice to be close to us attested. Like the cat in Houston it was obvious that this cat was once loved and had a home—it had a history, and that history determined its behavior, thus truly making it an individual with individual desires and needs. On the outskirts and far away from home, in the midst of doing errands for my friend’s daughter, we were at a loss to offer it true healing and saving and could not take it with us even though it tried to follow us out of the canal. That cat has remained on my mind ever since. At the very least saving the cat in Houston seems like a small redemption. I now think to the hundreds of thousands of people in Houston, homeless, living in shelters and in great need. Evacuees outside of the convention center. Many addicts were outside the center coming down off of their addictions and had vomited on the sidewalks. 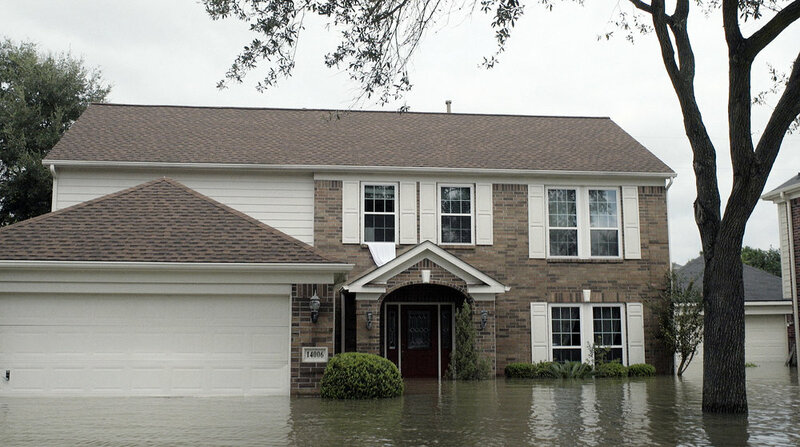 When a disaster such as Harvey happens the underlying needs of society are laid bare and take an additional toll on how to respond to the many requirements that people have to survive. Just as the needs of the two cats I mentioned here were thought only in terms of the physical, all too often the greater psychological needs of people following a disaster are overlooked. I think some of that is due to the fact that, getting caught up in the dramatic reportages coming out of these disasters exacerbated by climate change, we define people only in terms of their circumstance and miss the individuals within those hard circumstances. A little girl and her father outside of the Houston Convention Center. As the the coverage of the victims of Harvey begins to wane, their long struggle to heal and return to lives of normalcy has just begun. Much more will need to be attended to than just their physical well being—and that goes for all life forms that have made it through this disaster as resilience is put back into human beings, animals and the land itself. A woman receives information inside of the Houston Convention Center about how to receive assistance from FEMA. Before the storm the US government was constantly under attack for being wasteful and an intrusion on people’s lives—in the aftermath of a storm like this one it becomes instrumental in helping rebuild people’s lives.